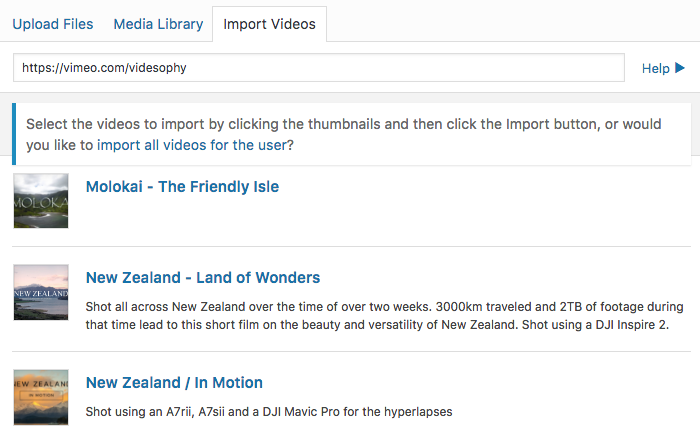 There are a number of ways to import Vimeo videos. The video will appear below the search bar. Check that it is the correct video and click the Import button in the bottom right hand corner. Please note : importing Vimeo albums requires a Vimeo access token. 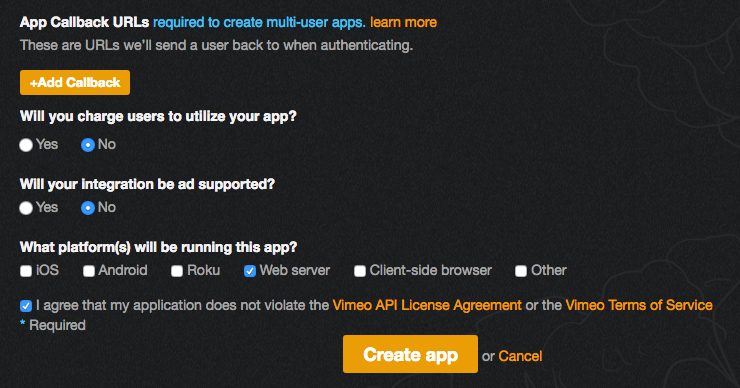 Please note : importing Vimeo channels requires a Vimeo access token. Please note : importing Vimeo user videos requires a Vimeo access token. If you want to import multiple videos from an album, channel or user then you will need an API access token. You can generate one by following these basic instructions. Visit https://developer.vimeo.com/apps/new and fill in the form. If you are not signed in you should be prompted to using your Vimeo account. In the App Name field enter a value like My FooGallery. In the App Description field enter a value like 'Allows importing of multiple videos from an album, channel or user into FooGallery'. See Step 1 below. In the App URL field enter the URL of your website. You can then ignore the App Logo URL and App Callback URLs fields. Set the Will you charge users to utilize your app? value to No. Set the Will your integration be ad supported? value to No. For the What platform(s) will be running this app? checklist simply select Web server. See Step 2 below. Agree to the license agreement and terms of service and then click the Create app button. Once the app is created select the Authentication tab and scroll down to the Generate an Access Token section. For the Scopes checklist the default of Public and Private should be enough however if you are a PRO subscriber or higher and can't access your videos you may also need to select the Video Files option as well. Finally click the Generate Token button (Step 3 below) and then copy the value from the Your new Access token field and enter it into either the prompt displayed during import (Step 4 below) or the FooGallery > Settings > Video > Vimeo Access Token option. 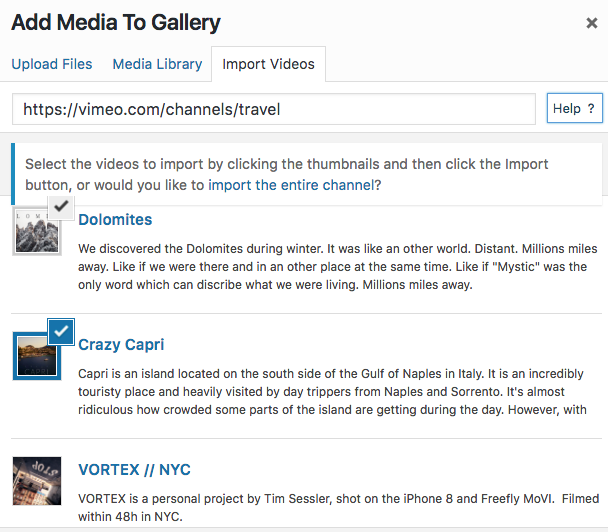 Once you have created your access token, you will be able to import multiple videos from Vimeo.